picturebookpalette | ideas and reviews to help you choose which picture book you'd like to peruse …. If ever there was a more intertextual book trailer, it’s got to be this one. We’re off on a summer holiday for the next two Thursdays. See you again on 12 July. For now, please accept this humble apology via a silly song. Lane Smith, New York: Roaring Brook Press, hb. 978 1 59643 607 7, $16.99, 2011, 32pp. I’ve always been fascinated by gardens. They’re peaceful. They’re pretty to look at. And they’re wonderful places to grow stories. In Grandpa Green, a 2012 Caldecott Honor Book, Lane Smith weaves together garden and story to create a heart-warming tale of a little boy and his relationship with his great-grandfather. The little boy’s brief history of his great-grandfather’s life is illustrated and explained by the topiary trees that he helps his great-grandfather tend. Babies, animals, familiar characters, and airplanes all have a special place in the garden and in the great-grandfather’s memory. Smith’s color palette, concise text, and unique illustrations work together beautifully. The darker and almost heavier illustrations of the topiary trees represent the past while the lighter illustrations of the boy remind the reader of the present. The blending of light and dark helps younger readers separate memories of the past with actions of the present while also showing how the two are connected. The simple, concise text leaves just the right amount of gaps; readers will enjoy coming back to the story to discover new ideas and images. I’ve hit an age where I’m growing more and more interested in my family’s history. I only have one grandparent still living, and I regret not asking the others more questions about their lives while they were here. Smith’s story touches on themes of aging and family history, and I’m very jealous of the little boy who knows so much about his great-grandfather’s life. I love the idea of a physical history in the form of topiary trees that the little boy and the now often forgetful great-grandfather can peruse at their leisure. I also love how the little boy remains connected to his family’s past through his upkeep of the garden. Grandpa Green is a truly moving tale that should be shared with all members of the family. Perhaps it will inspire you to create your own account of family history. Holly Grise is a freelance writer and editor in educational publishing and hails from Ohio, USA. You can learn more about her on our About Us page or check out her blog, Embracing the Geek. We’re very excited to have her keen insights in children’s literature now on Picture Book Palette as a guest blogger! HT Macmillan for the photo! Nikki McClure, New York: Abrams Books for Young Readers, pb.978-0-8109-8468-4, £11.99, 2010, 32pp. Firstly, sorry for the late posting–with the change in the weather (haha), I was taken ill this last week. But, I’m back to health & have been waiting to share this picture book with you for two whole weeks now! I first came across Nikki McClure’s paper cuts when living in Santa Cruz, CA, a town so in-tune with her images they have become synonymous with each other in my head. When I came across her picture books in a bookstore in London, it was like a breath of fresh air. Then I saw the title, Mama, Is It Summer Yet?, and I laughed: I have asked my partner this basic question–is it summer yet? !--during our last 4 years of British summer! 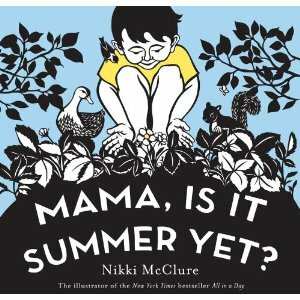 Hailing from a similarly wet climate, Nikki McClure’s Mama, Is It Summer Yet? (2010) opens with mother and child standing at the window, the trees bare and cut-out snowflakes taped to the glass. While both of them face away from the reader, the single line on the opposite page, “Mama, is it summer yet?”, begins the implied conversation between mother and child that is the accompanying text to McClure’s images. Call and response on alternating double-page spreads, the mother recounts to her “little one” the reasons why it is “not yet” summer. What I love about what McClure does with the mother’s responses is that instead of describing the current season in terms of how it is not summer (i.e. it’s cold, or windy, or January, for goodness sake), the text offers hopeful clues for the change of the seasons until it is undeniably summer once more. The text moves the story forward, but it really is the images that narrate the passing of time. McClure’s paper cuts are stunning in their expression and simple power, as seen on the cover for example. For each of the child-speaking double pages spreads, the left-hand page is a muted block colour (green, brown, blue, purple, etc) while the mother and child appear on the right-hand page in black and white, preparing to do one task or another. Turn the page for the mother’s response, the image transcends all borders in depicting what season-relevant activity mother and child are up to. On this second double-page spread, the colour from the child’s question page also draws attention to the elements relevant to the mother’s response, e.g. if the question page is yellow than it is the ducklings (plus wells and life jacket) that have been picked out and coloured in yellow. And when it is finally summer? Well, then all the colours appear! Even the end pages of this picture book are gorgeous: red with “snowflakes” designed out of all the parts of a strawberry plant–berries, blossoms, leaves and stems. Mama, Is It Summer Yet? is fantastic for any child who is curious about the seasons, any family that loves the outdoors, DIY or gardening, and any person who just can’t wait for it to be summer already. And, whether it is this picture book or another (or a calendar, or a print), if you are unfamiliar with Nikki McClure’s work, do check her out! As her website reads, McClure “creates a bold language that translates the complex poetry of motherhood, nature, and activism into a simple and endearing picture.” Couldn’t have said it better myself. HT Amazon for the photo. 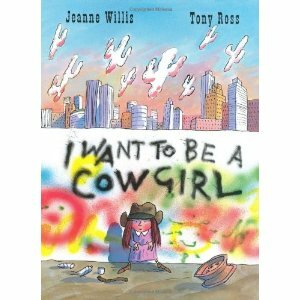 Jeanne Willis & Tony Ross, London: Anderson Press, pb. 978-1-84270-308-3, 2001, p32. Have you got any cowgirl favourites of your own?? 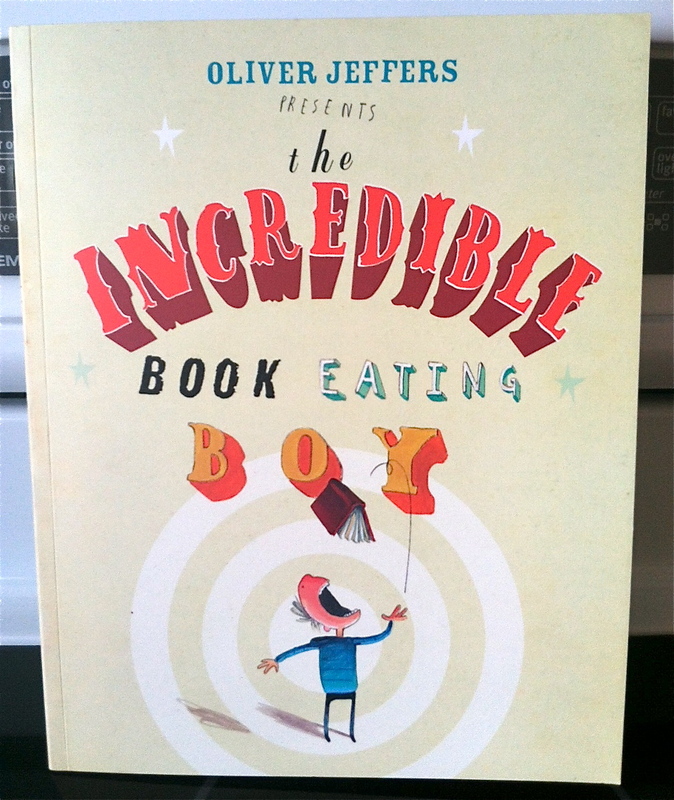 Guest Blogger: The Incredible Book Eating Boy! Oliver Jeffers, London: HarperCollins Children’s Books, pb. 978 0 00 718231 2, £5.99, 2009 (this edition), 32pp. “Henry loved books. But not like you and I love books, no. Not quite . . .
Oliver Jeffers’ The Incredible Book Eating Boy is a humorous tale about a boy named Henry who discovers he has a taste for books. After testing out a word and then a sentence and then an entire page, Henry starts consuming books whole. He’s not picky about what books he eats; he loves them all. Story books, dictionaries, maths books . . . they all taste delicious in Henry’s tummy. An interesting side effect of Henry’s favorite dish is that his brain seems to be digesting the books as well. Unfortunately, something starts to go horribly wrong and all of the information from the books seems to be getting muddled together. What will Henry do? Jeffers’ story is perfect for anyone who loves books. Aimed at older picture book readers (3-6 year olds), The Incredible Book Eating Boy provides a silly, enjoyable story while also teaching a lesson about the power of books. The placement of the text on each page is never the same, forcing older readers to pay attention and consider how books work. It’s an interesting look into how the form and style of books can be manipulated to create something new and fun. The real stars of the book for me, however, are the illustrations. Actually, I don’t think illustration is the correct word for what Jeffers produces in this book. Each page is like a piece of art. Varying textures and a unique color palette work harmoniously with the text. Words, sentences, and pages from existing books blend into the background, supplying older readers with plenty to see and discuss. All of the images that Jeffers’ provides make The Incredible Book Eating Boy one of those books where you stumble on something new each time you pick it up. I would definitely recommend this book to anyone. Jonah Winter and illustrated by Ana Juan, London: Frances Lincoln Children’s Books (New York: Scholastic, USA), ISBN: 1-84507-354-1, £10.99, 2005 (this edition), 28pp. Where do you begin with the story of Frida Kahlo? For little Frida, that world is Mexico. Her house is a blue house. It is in the town of Coyoacán. 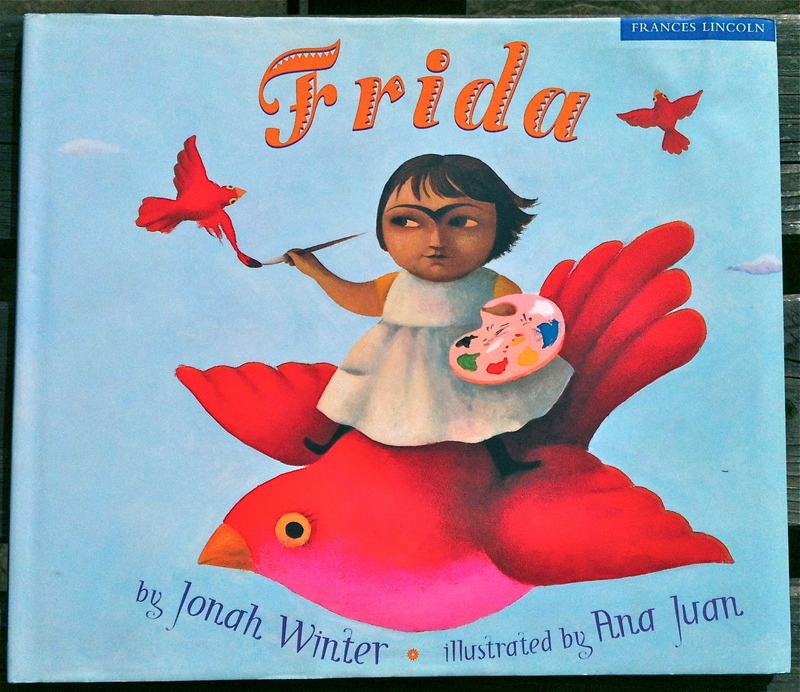 In Frida, Jonah Winter* gently writes the story of Kahlo’s life while Ana Juan brings the imagination of a child Kahlo to the eyes of the reader. The text is very sparse and it really is the illustrations that tell her story. While other recognisable human figures appear in the book, largely it is just Frida–accompanied by creatures and scenes from her imagination. As Juan explains in her artist’s note at the end of the picture book, these figures are ‘traditional characters in Mexican folk art — funny skeletons, little devils, sweet jaguars and others.’ Juan suggests that these figures would have been in Kahlo’s surroundings as a child, but also states that she has seen them in photographs of Diego Rivera and Kahlo’s home. In this way, Winter and Juan very much set Kahlo’s work within the cultural context of Mexico. They bring this to forefront again at the end of the picture book by linking her work to exvotos (loosely, miracle paintings). Just as Kahlo’s life was not without pain, this story does not skirt around her illness, accident, or lengths of time in bed. However, the text and illustrations translate this pain and suffering into compassionate experiences for child reader. Winter and Juan also bring focus to Kahlo’s time in recovery and/or pain as the opportunities when she learned to draw and paint, subtly delivering one message of this book: from horrible incidents, good things can come. Nothing can stop Frida from painting. She’s often alone, unable to leave her house, so she has to use her imagination. She paints what she sees with her eyes — and on top she paints what she sees in her heart…. In this way, Winter and Juan give permission to any child (or adult) reader who wishes to paint what they see–whether with their eyes or with their heart. Thank you, Eleonora Guerrero, for giving me this picture book–a fellow picture book enthusiast, artist and friend! Coincidentally, she has just featured Biblioburro by Jeanette Winter (Jonah Winter’s mother) on her Colombian children’s literature blog, Armadillos Voladores. *Jonah Winter also wrote Gertrude is Gertrude is Gertrude is Gertrude that I mentioned back in April–just sharing the love. Colin Stimpson, Dorking: Templar Publishing, ISBN 978-1-84877-215-1, £12.99, 2012 (first edition), 32pp. 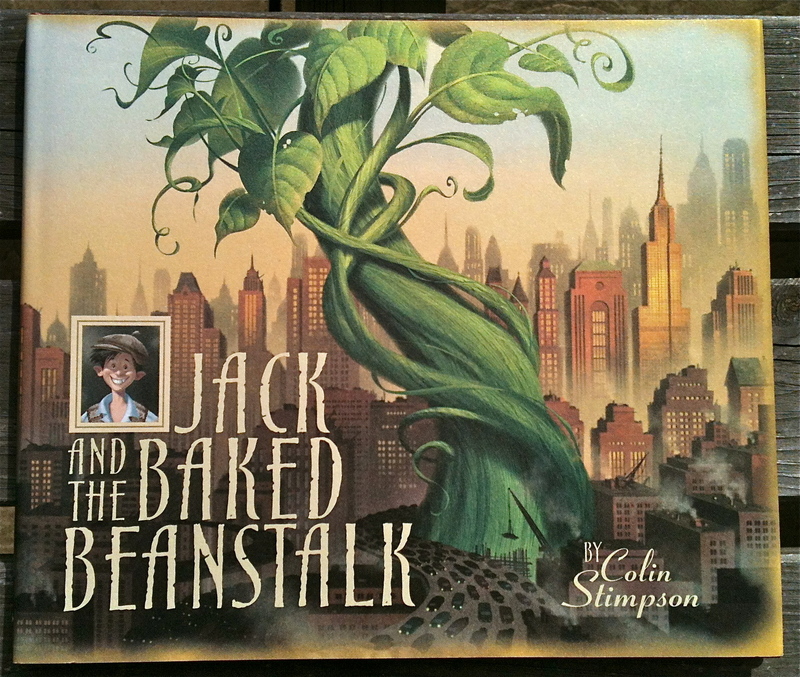 Open the picture book and you are swept into a 1950s Americana-but-English version of Jack and the Beanstalk. Jack, his mum, and their dog Bella own Jack’s Fast Food, serving the locals from their long-since-brokedown caravan at the edge of a busy city. Times change though and the city council decides to build a flyover (an overpass, for those Americans reading) right over the cafe, taking all their customers away. Soon, Jack and his mum are down to their last pennies. Sent to the shop to buy milk and coffee beans, Jack comes home with a tin of magic baked beans instead–and the adventure begins the very next morning! While this is author/illustrator Stimpson’s first picture book, he has worked as an art director and production designer in the film industry (insert names like Spielberg and Disney here) so his illustrations read very much like film stills. As if to emphasise this, two-thirds of the book’s illustrations are couched in double white borders, given them a photographic appearance. When the illustrations do take over the entire double page spread space, the effect is breathtaking in its emphasis. Jack and the Baked Beanstalk is a delightful read for anyone who loves a new take on an old classic. Polly Dunbar, London: Walker Book, ISBN 978-1-4063-2714-4, £11.99 (UK only), 2012. In my post on children’s poetry a few weeks ago, I referenced Here’s a Little Poem, a poetry book completely illustrated by Polly Dunbar. 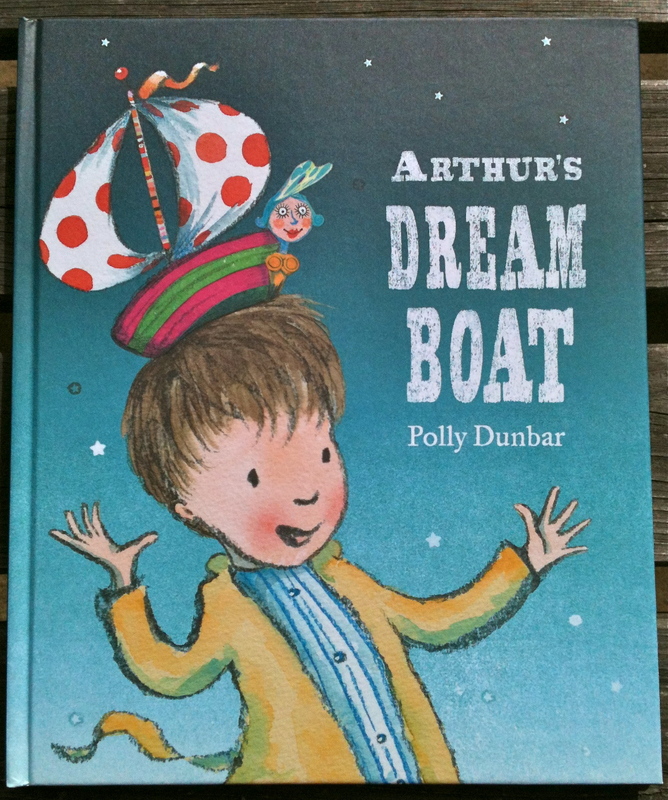 Well, after a recent trip to the book shop, I was delighted to pick up Dunbar’s most recent picture book: Arthur’s Dream Boat (2012). Anything with boats usually catches my eye, but as you can see from the cover, too, Arthur is a loveable character from the outset–who doesn’t want stripy pyjamas, a yellow housecoat and a spotty sailboat on your head?! The opening end papers are a soft watercolour scene of a sail boat (at the edge of the left-hand page) on the wide, wide sea. Turning to the title page, the sun has risen, bright and circular in the sky, and the sailboat has traveled to the centre of the right-hand page. Follow to the next page over and–oh!–the sailboat is on Arthur’s head! A little white sailboat with Arthur stretching himself awake, a tabby cat at the foot of his bed and the family dog sleeping on the floor. Just like motion of the sailboat on the initial pages of Dunbar’s picture book, the reader is taken along on the journey of building Arthur’s dream boat. Not the physical building of it, mind you, but the descriptive building of the boat. On each double page spread, Arthur meets another family member–starting with his dog, then his brother, mother, sister, and father–and with each interaction a texture of the sailboat is added to both the description and the illustration. Arthur’s dream boat is being influenced by those around him and becomes more and more vibrant with each page–and it takes the keen eye of the reader to sometimes find the source of the inspiration! However, even with their integral part in creating his dream boat, Arthur’s family is not listening to his dream. Frustrated, he musters all his might and manifests his DREAM BOAT… the winds slowly whirl around him as the water seeps into the house, sweeping up Arthur’s family into his dream boat and Arthur a happy captain sailing off into the sunset. Dr. Seuss, London: HarperCollins Children’s Books, pb. 978 0 00 736554 8, £5.99, 2010 (this edition), 50pp. I realize that I’m possibly making some of you cringe by bringing up a Christmas-themed picture book in April, but for my first review I wanted to select not only a great picture book but also one that was special to me. This book feels so much a part of me that I don’t feel complete unless I read it every year. How the Grinch Stole Christmas! is Dr. Seuss at his best. An omniscient and rather opinionated narrator introduces the reader to the Grinch and his dislike of the Whos in Who-ville during Christmas. 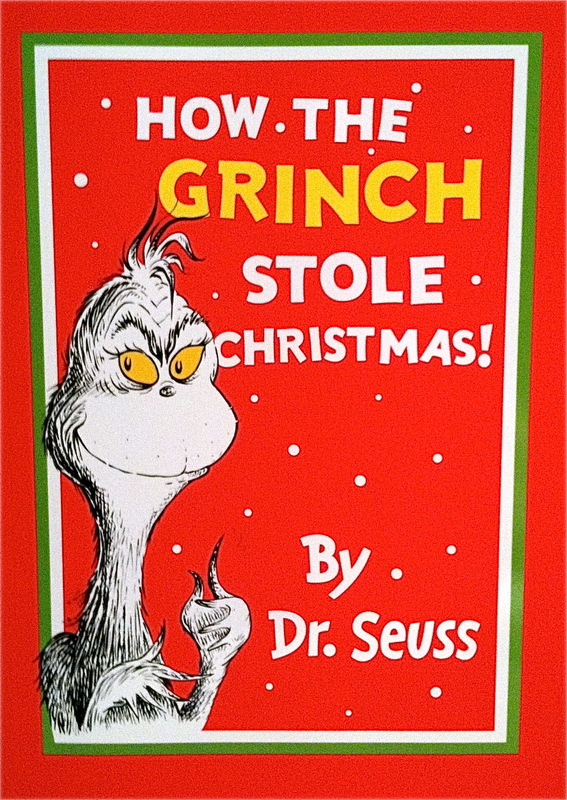 The narrator supplies the story of how the Grinch attempts to ruin Christmas while also almost winking at and nudging the reader at the awfulness and ridiculousness of the Grinch. “Then he went up the chimney, himself, the old liar.” Phrases such as “the old liar” pull in readers to identify with the point of view of the narrator and also allow readers to act as all-knowing beings who know better than the silly old Grinch. This relationship between narrator and reader makes the book’s message feel like a joint endeavor. Readers feel that they themselves are teaching the Grinch the true meaning of Christmas. While readers feel pride in teaching the Grinch an important lesson, they take absolute delight in the readability of the text and the play with language. The rhyme and rhythm of the text begs it to be read aloud. Each time I pick up the book to read it I attempt to read silently only to discover several pages in that I’m actually reading aloud to myself. Words that are changed to maintain the rhyme scheme (“chimbley” instead of “chimney”) and the use of alliteration and repetition (“And he puzzled three hours, till his puzzler was sore”) show readers how fun language can be. One of the best lessons I’ve learned from children’s books, especially books with poetry, is the importance of understanding how words work so that you can later break those rules to create something new and exciting. Dr. Seuss is an excellent introduction to this lesson for any child.